With the luffing jib set WSI completes the LTM1500-8.1 perfectly. 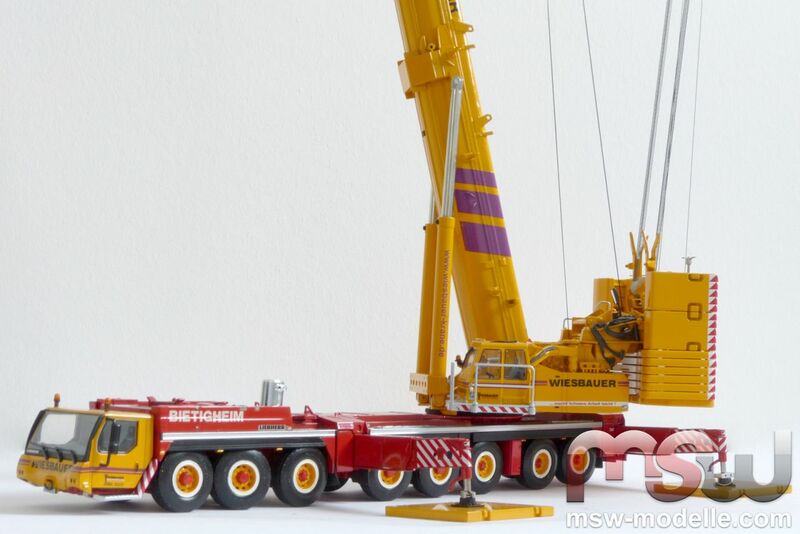 This additional set provides many combinations to the already nice crane as in reality. Even the spacer is enclosed to the luffing jib set. Functionality and details are perfectly combined. One eye-catching feature is for sure the lattice boom sections made of plastic. This is also quite visible. Only the main boom extension, the luffing jib base section with A-frames are made of zinc. While on the first glance it might be surprising, but finally this concepts safes much weight. If the whole jib had been made of zinc, the highly detailed base crane would have to carry too much weight. And with this concept the LTM15000-8.1 easily could be displayed with the fully assembled jib including all sections. 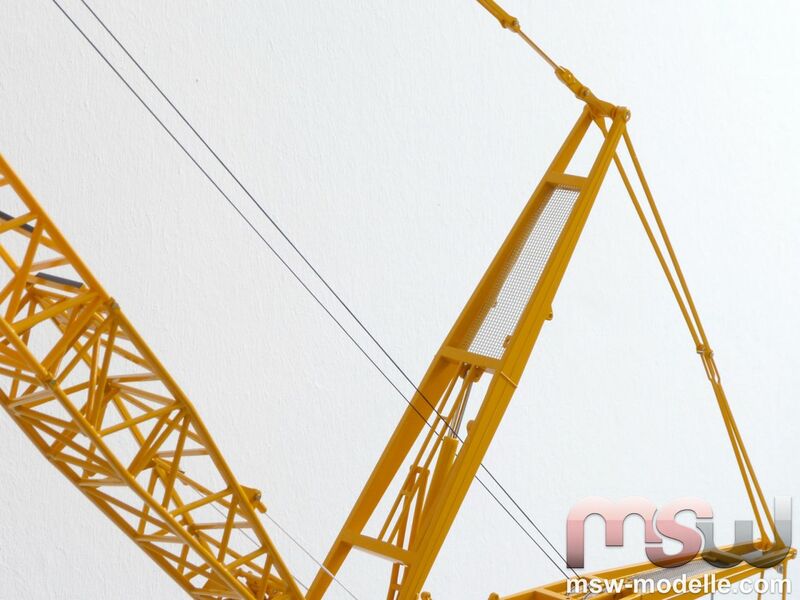 WSI really did a great job with this accessory set and the usage of plastic for some parts cannot be seen as a disadvantage but more as an advantage since it protects the crane. 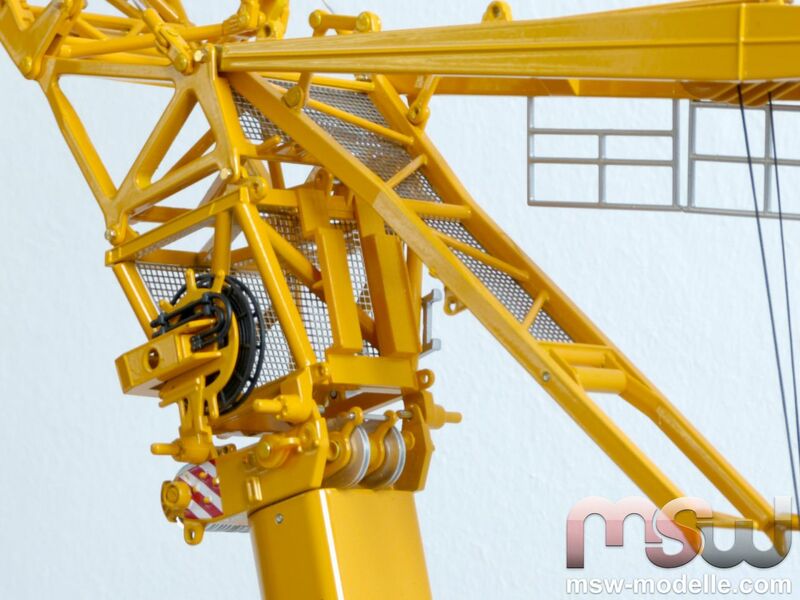 With this luffing jib WSI presents the perfect accessory for the highly detailed LTM1500-8.1. Many combinations can be shown, as for example the TVY3N version. 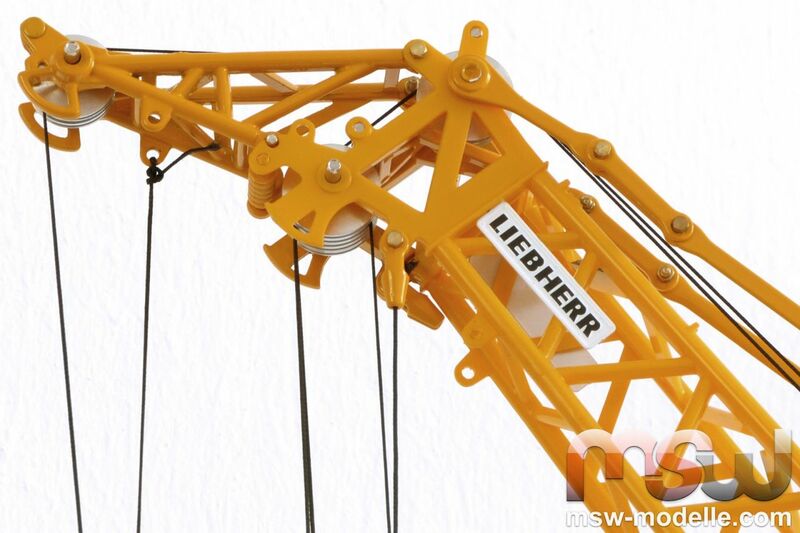 This would include the boom extension with luffing jib and guyed main boom or the flying jib. Shown on the picture is the luffing jib without Y-guying system. 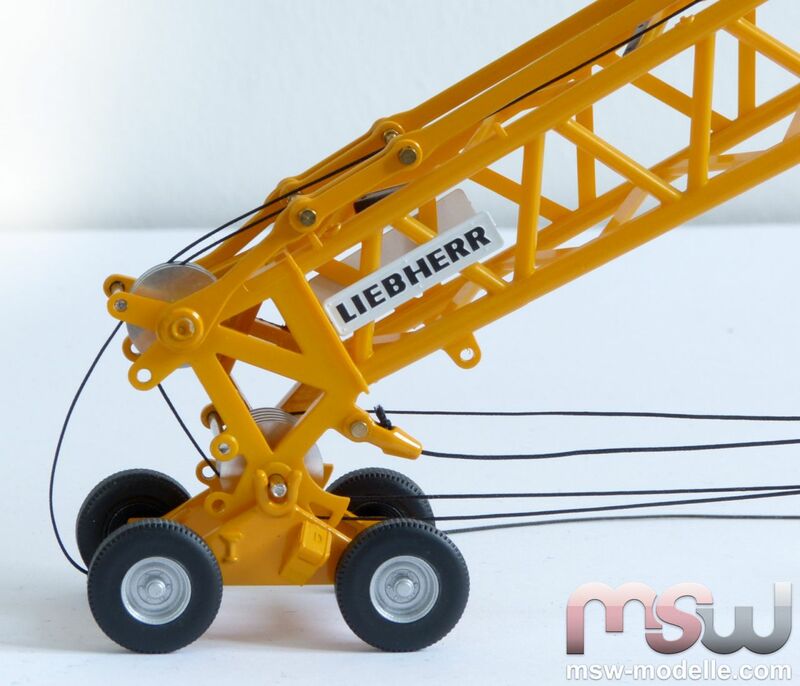 This yellow colored accessory set perfectly fits to the Liebherr company colored crane model, but also the Wiesbauer version gets much more impressive with luffing jib. Fully assembled the luffing jib would reach in reality a length of amazing 91 m or in the smallest version 21 m.
All sections on the model are casted in one piece and perfectly fit together. 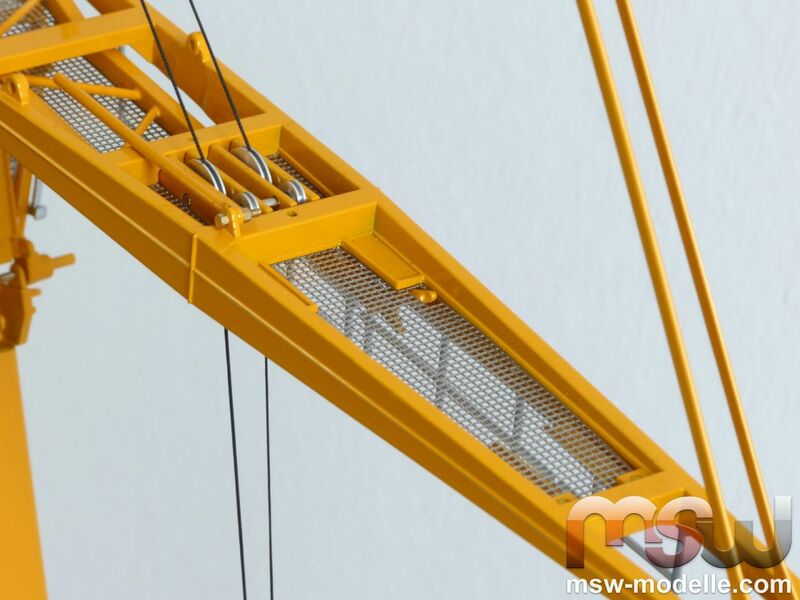 Therefore they do not show the concepts with eyes as on the LTM1350 luffing jib. And even the intersections from plastic to zinc parts are accurately fitting. Only the base crane needs some re-fitting work. The last winch #3 in reality operates the flying sheaves for the luffing jib. WSI reeved the fly sheave with the second winch, which is not correct and can easily be corrected. 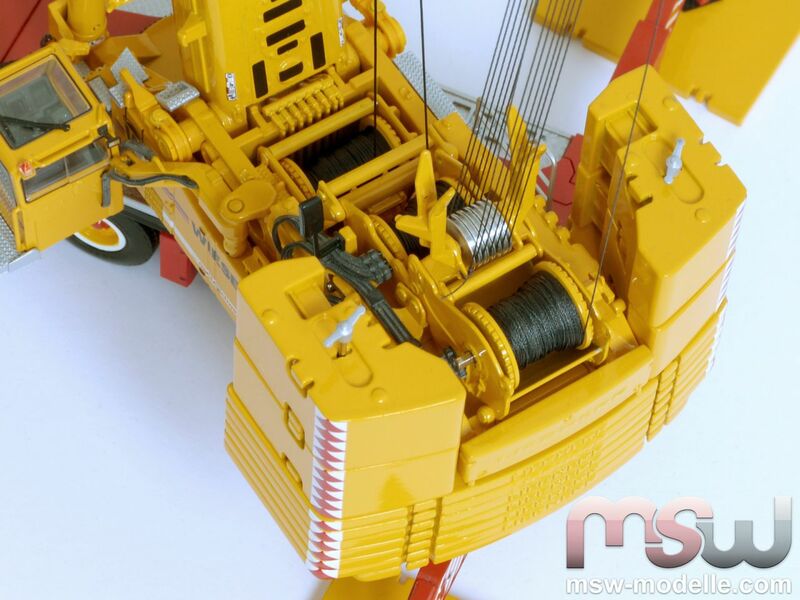 The pictures already show the correct winch. Small walking grids made of photo-etched parts are attached to both A-frames. A small ladder sideways completes the details. And also the hose wheel on the left side of the boom adapter is nicely done. All boom pendants are zinc made. Another small pendant can be assembled between the main pendant and the adapter boom section. This additional pendant is required when working with very long luffing jibs and supports the boom by avoiding bending of the jib. The backward boom supports protect the luffing jib of turning backside. 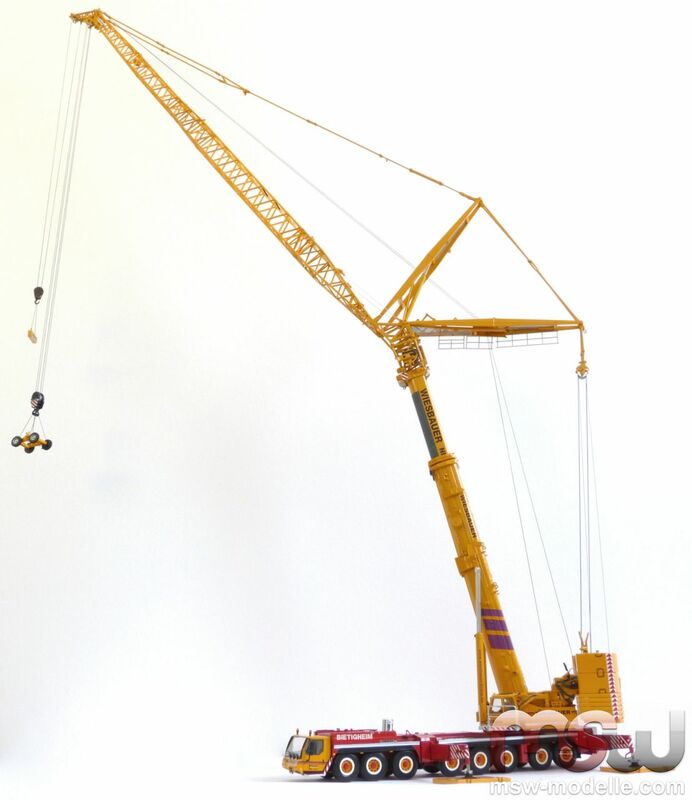 And with the third smaller A-frame a realistic assembly of the crane with ultra long luffing jibs can be shown. This third A-frame supports the whole system since the luffing jib can be erected when the main boom is already hoisted to an 85° angle. Small handrails are supplied in the accessories bag and need to be attached to the first A-frame. These handrails are a nice optical touch due to their color. In reality they are needed for safety reasons while the luffing jib is assembled and the team is working onto them. 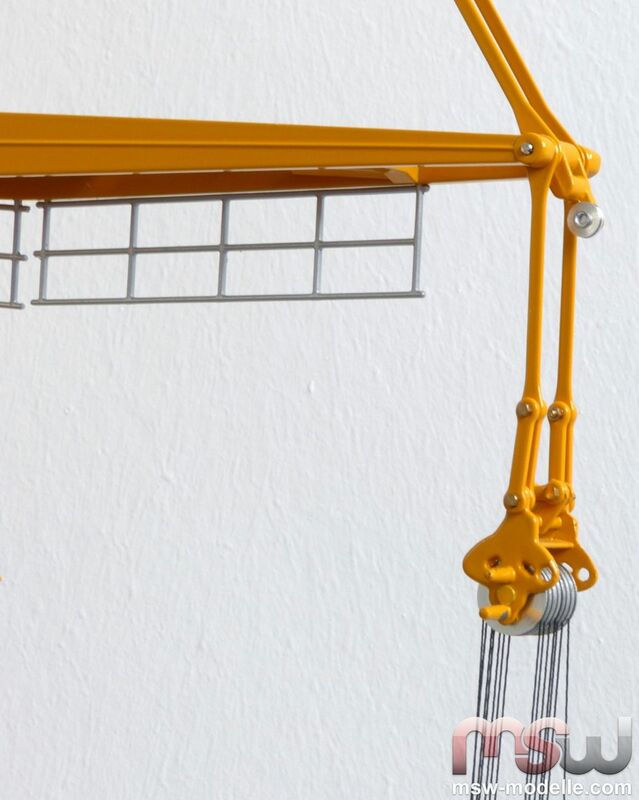 The impressive crane model at work with two hooks. The main hook is reeved with four lines; the final end of this line is attached to the main boom with the typical WSI rope clamp – exactly as on the real crane. 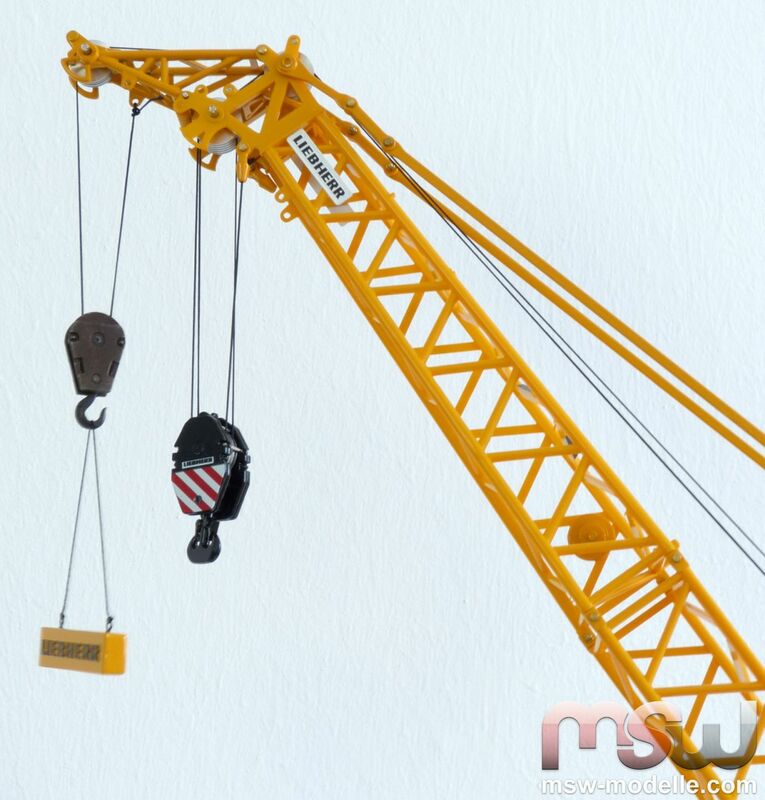 For the auxiliary hook on this crane a hook from Conrad was used. All boom sections are accurately produced and small M1 screws with nuts connect the boom securely. With these plastic boom sections the luffing jib is much lighter and eases the crane. 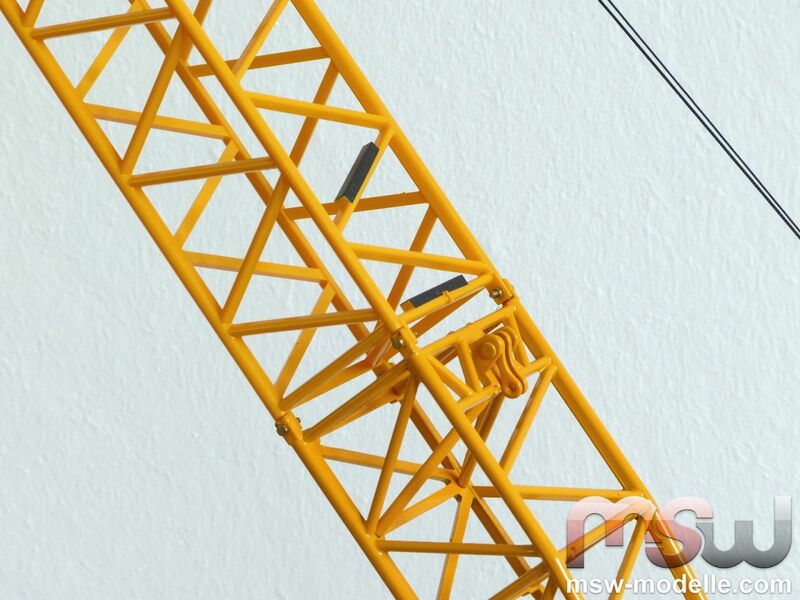 That is why even the complete jib with all sections can easily been assembled to the LTM1500-8.1 base crane. And also on the runner the different materials of the boom parts are clearly visible. But this is definitely an advantage. The luffing jib set also includes all parts for the flying jib. Here this flying jib is shortly assembled to the crane model. Hydraulic cylinders in reality could adjust the fly jib. On the model small socket screws can be set in order to display the jib in each position. While raising the main boom with the assembled luffing jib, a small car guides the jib rolling on the surface. WSI copied this car also authentic with the small eyes and the four tires.